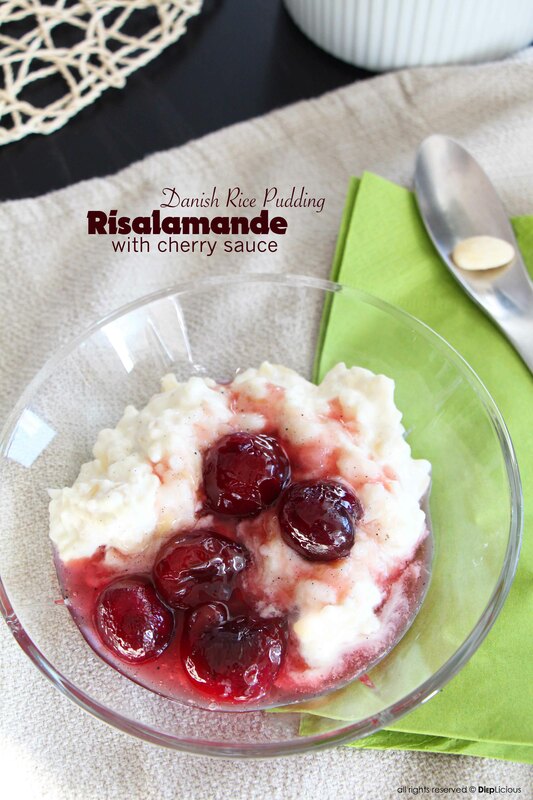 Risalamande means ‘rice with almonds’, and is a grand Danish Christmas dessert tradition. While not overly sweet, it is quite filling and can be challenging to eat after gorging on a heavy Danish Christmas dinner. However – it’s tradition and I love it. Growing up, it wasn’t just the Christmas presents we looked forward to, but all the fun games and traditions as well. For example, one tradition is to sing, hold hands and dance in a circle around the Christmas tree (with lit candles on the tree!). The risalamande tradition is part of a game as well. The Danes take unevenly chopped almonds with the skins removed and mix them into the rice pudding, making them almost invisible. Aside from the partially chopped almonds, one whole almond is mixed in. Whoever finds the whole almond wins a prize. This requires eating the risalamande carefully so you don’t accidentally chew the prize almond. It is also an unspoken (if somewhat cruel) rule that if you find the prize almond, you hide it as long as you can (in your mouth or into a napkin, for example), so that everyone else keeps eating. As kids, one year my brother got sick from eating too much because he really wanted the prize almond – of course my father had been hiding it the whole time. You can make the rice porridge the day before and then stir in the almonds and whip cream right before serving. • 1 ½ pounds pitted cherries, fresh or frozen are preferred but brined works as well. 1. Add the rice and milk to a large stock pot/Dutch oven. 2. Cut the vanilla pods halfway along the stem, scrape out the vanilla beans and add the beans and pods in the pot with rice and milk. Let it simmer at low heat under a lid for about 40-60 minutes or until the rice porridge is just about done. Stir occasionally to prevent the rice from burning to the bottom. I usually turn off the heat when there is still a tiny bit of liquid on the top. 4. Leave it to cool completely and store it in the refrigerator. I usually make this part the day before I serve it. 5. The day of serving, whip the heavy cream and sugar together into a thick whipped cream. 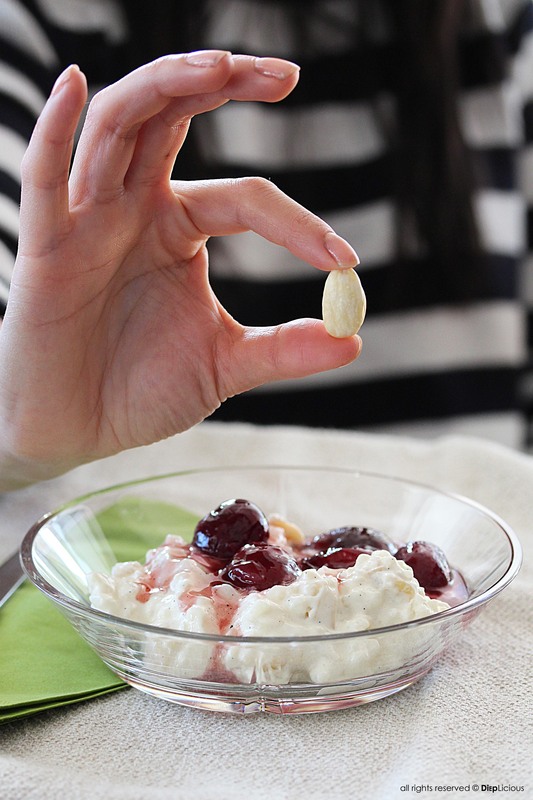 Stir the almonds and the whipped cream together with the rice porridge (don’t forget to add the whole ‘prize’ almond in the mix). 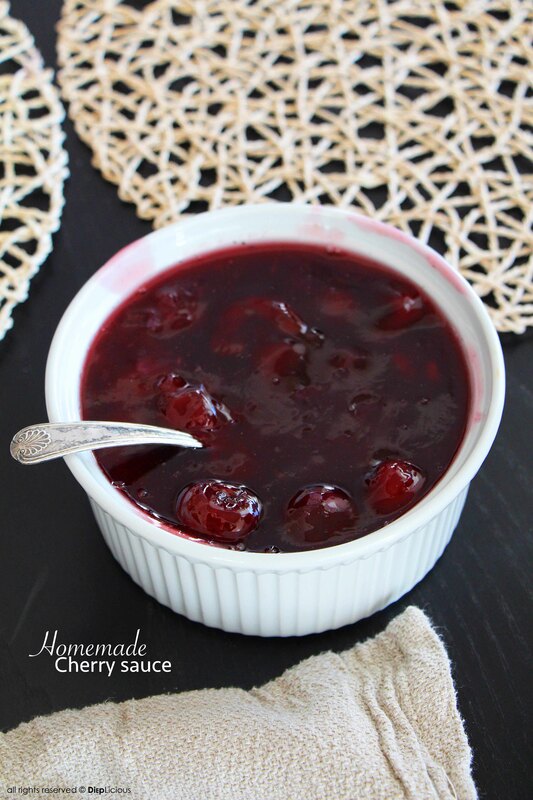 You can make the cherry sauce the day before as well and just reheat it in the pot, or make it right before serving. 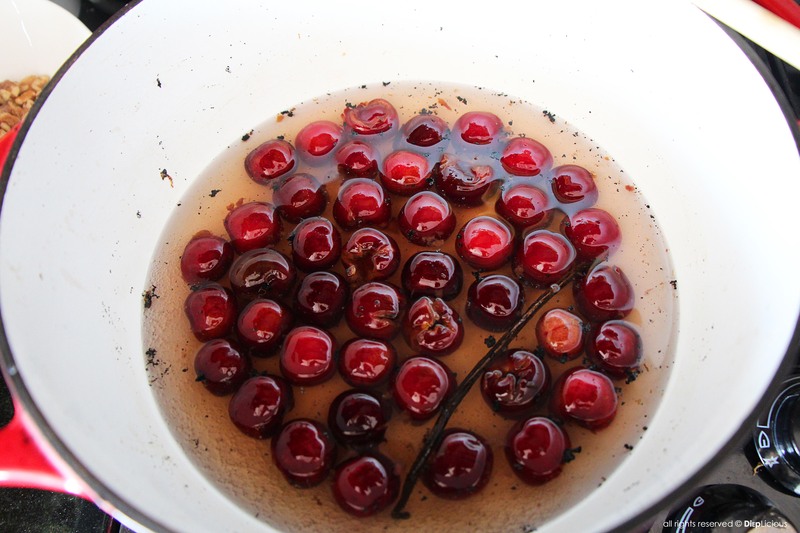 Set some time aside to pit the cherries, as it can be a little time consuming unless you buy them frozen or brined. 1. Bring the cherries, sugar and flaked pods and beans to a simmer for about 15 min. 2. Dissolve the cornstarch in enough water to make a thin paste and slowly add it to the cherry sauce. Stir constantly until it thickens. Remove the vanilla pod. 3. 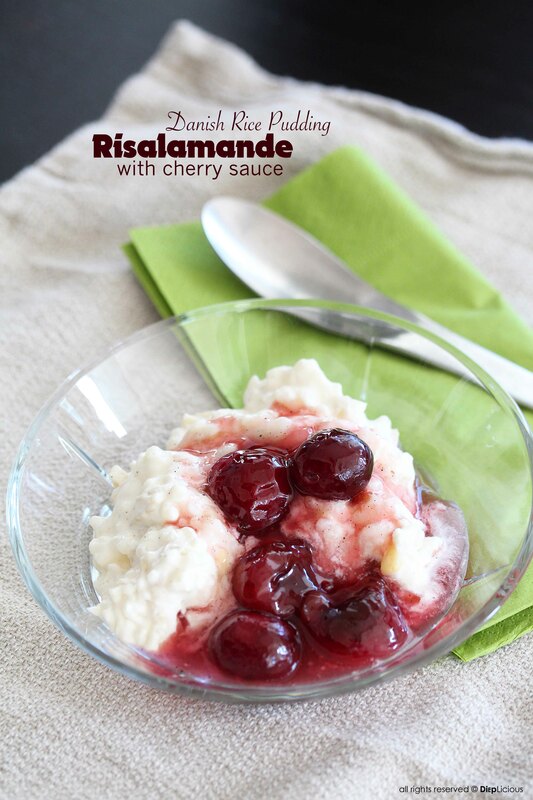 Serve the cherry sauce over cold risalamande. *To skin the almonds, boil some water and pour over the almonds. Let them sit for a few minutes in the hot water, then drain and rinse with cold water. The skin will slowly loosen and will be easy to remove (if the skin is still hard to remove, repeat the process again). I love Risalamande!!! It’s our dessert every Christmas eve, and my breakfast every Christmas morning:) My dad lived in Denmark for almost 3 year and brought this and a few other great Danish traditions back with him. Now my kids love it as much as I did as a kid:) Thanks for sharing!!! I lost my recipe (don’t ask) and I am so happy to have this for dinner tomorrow night! I grew up with this & it was always such a fun ending. Yes I love this little tradition. It doesn’t feel liek a real Christmas without this for dessert. Yes! Thank you!! I’m a Dane-but have been living in MI almost 20 years… I’m attempting to recreate the Ris ala Mande from growing up, but was stumped on what to do for the grødris (Rice)… Thank you for creating the recepie to be made in the States! Tak Lisa you are welcome. Funny thing is i was just craving for some ris ala mande when you wrote.